Great American Novel survives another film—will it survive itself? On Sunday morning while church bells rang in the villages alongshore, the world and its mistress returned to Gatsby’s house and twinkled hilariously on his lawn. As famous as are The Great Gatsby’s gorgeous opening and ending passages, the above line shows as well as anything the1925 novel’s elusive poetic magic. Gardens are blue, cocktail music is yellow, and trays of silver drinks float in the dusk. In prose at once specific and grandly metaphoric, The Great Gatsby unspools a plot utterly American in its larceny and its romance: the story of a rags-to-riches-shady-but-essentially-good-social-climbing outlaw whose self-invention and male yearning end in murder. Since I’ve loved Gatsby for much of my life, I resisted seeing until recently the latest movie based upon it. I doubted whether Leonardo DiCaprio could get off Gatsby’s “old sport” tic without sounding ridiculous. “Old sport” was the nail in the coffin of Robert Redford’s inert performance in the 1974 film flop. To me, Luhrmann’s Gatsby and its centerpiece party are properly riotous—he brings brassily to life the wild gaiety to which the novel alludes. In the novel, we’re told that Gatsby is about servicing a “vast, vulgar, and meretricious beauty” and that his guests conduct themselves “according to the rules of behavior associated with an amusement park.” So Luhrmann’s attempt to render this is vulgar? 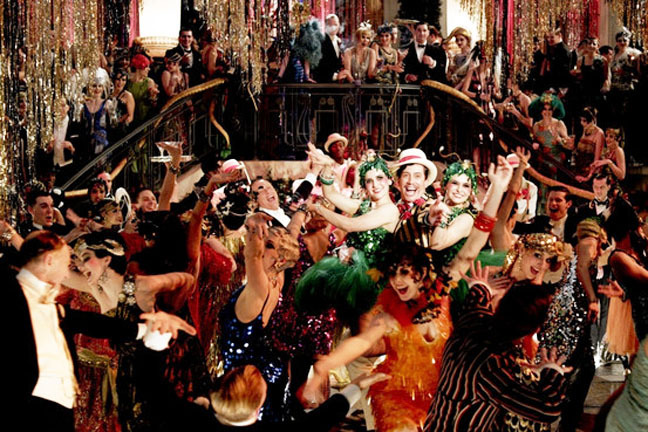 And though F. Scott Fitzgerald felt no need to point out the obvious, it helps that Luhrmann does, in a deft voice-over: the action occurs in 1922, with Prohibition in full swing and foaming with paradoxes: alcohol was more abundant, cheaper, and more alluring than it had ever been. Luhrmann appears to have a genuine love and understanding for the slender, jaunty novel and its hyper-literary quality. Toby McGuire is well cast as Nick Carraway, who in the text as well is trying to make writerly sense of Gatsby and his fate. Nick’s wan love interest, Jordan Baker, played by a strapping, striking actress, does not fit my image of her, but what the heck. Luhrmann’s Daisy is fine. 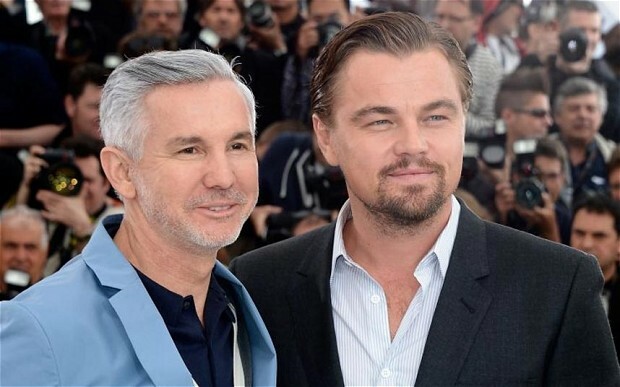 And DiCaprio not only gets off multiple credible “old sports,” he breathes to life Gatsby, who becomes far more real than he is in the novel; not just rich and driven, he’s also insecure and charismatic. This is how some movies bigfoot their prose sources: they make textual fancies palpably real. In short, Luhrmann’s movie is as gorgeous, specific, and unmoored as the novel. Yet this begs the question of whether Fitzgerald’s masterpiece, which still sells 500,000 copies a year and is widely used in schools, will endure as the iconic Great American Novel. One of its portrayals seems anti-Semitic. And though Fitzgerald and his stand-in Carraway mock Tom Buchanan for his racism, later Carraway makes a comment that’s jarringly racist. Maybe this is more verisimilitude, reflecting the book’s times or Carraway—not fatuous like Buchanan but still a man of his times. Yet now, at the least, these ugly notes date the book; literature in America isn’t assumed any longer to be the province of male WASPs. Interestingly, Luhrmann silently addresses both flaws, in the later case by the inspired infusion of black musicians. This aspect of the novel pains me on this, my latest rereading. I think it’s having taught and identified with students of diverse ethnicities and sexual orientations. Suddenly you see the world through their eyes, and even pop songs can seem a phalanx of cruelly narrow heterosexual orthodoxy. As narrator, Carraway is someone we’re meant to identify with, and I picture a black kid getting to that line, where Carraway calls two black men “bucks.” As much as I’ve loved it, I wouldn’t want to teach Gatsby. 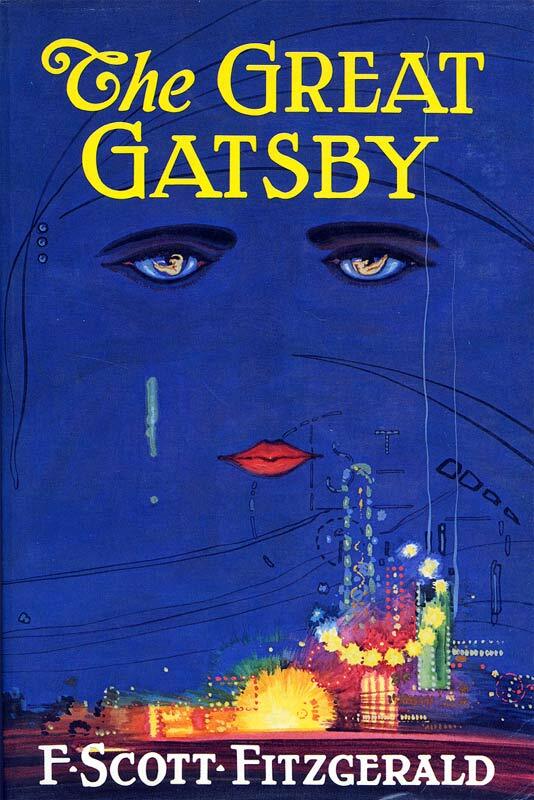 Previously I wrote about Gatsby’s memoiristic structure. Your conclusion about not wanting to teach Gatsby because of its current incorrectness fascinates me. I get what you’re saying, but …. Is relegating these matters to the dust of the attic the equivalent of not teaching about the Holocaust? I know that’s an extreme example. And maybe the novel belongs in a history or cultural anthropology class. But still, isn’t it an accurate representation of an era? Should we pretend these things never happened? Is allowing them to be forgotten the best idea? Maybe … My mind is open. That’s looking back. Looking forward, a couple of weeks ago I advised a friend from abroad who has written a spy thriller set in the USA to avoid the use of a couple of racial ephithets about an Asian character. He had no idea how incorrect they sound over here, and would have sounded even at the time his story is set in. I don’t want him damaging any prospect of an otherwise brilliant novel. He got the message. Those words added less than they subtracted, and they are gone. Thanks for the movie review. You’ve convinced me to watch. Thanks, Sharon. One of the reasons for my post is that I’m not positive, but thinking out loud. I would not ban it, but would be reluctant; my experience is that, at my institution, students of color are so few that addressing it would be something they would find awkward, and not addressing it seems wrong. I had a similar experience as yours with your friend. When I was at a university press we published a memoir by an American who had been living in Brazil for 50 years. She was more Brazilian than American and unaware of all the trip wires here. She was comfortable with their class system, something we can’t even admit in America, and generalized at least in one place about a local “breed” of humans made from various racial strains. Since she wrote in all sympathy and innocence, I did not think either reference would be a problem. The book was massacred by New York reviewers for her racist attitudes; they also wanted her to attack actively Brazil’s class and political system. If Gatsby were just being discovered, it would be held to this standard too. There is a way Americans now can write about race and class, or skirt them, that did not exist when Gatsby was published and apparently does not exist in Brazil. But, as I say, my feeling is deeply personal, whereas New York reviewers do look less sympathetically and more critically at texts in this regard, especially ones being brought back into print—I had other experiences I won’t go into . . .
Hi, Richard. I am going to admit to a certain form of ignorance, not about “The Great Gatsby,” which I read willingly in my obligatory (and desired) “great American novel” course in undergraduate years, but about Leonard DiCaprio. I have never managed to get over a strong dislike, a strong and visceral and totally illogical dislike, for DiCaprio. I can’t even recall what I first saw him in, but it was very early in his career, and I simply can’t account for the feeling. I didn’t see him in what people insist was his creditable take on Howard Hughes, and I will in all likelihood not see him in the movie you speak of, and it’s my ignorance and limitation, but I just can’t stand him. As to the the “great American novel,” there was a strong predisposition in my professor’s eyes at least to cast “A Death in the Family” (James Agee) in that role. I was perhaps even more receptive to that idea because of having lost my own father when young, too. About Fitzgerald, I think the book is iconic, but I agree with you about the difficulty of trying to teach it post-contemporary-consciousness-raising about racism and ethnocentricism. I guess if I had to teach it, I would make the attempt to challenge the issues head-on, and perhaps that would be the wrong way, but I’m not sure I know any other honest way to go about it. At any rate, I did enjoy your post on the movie, even more because I’m not planning to see this version of it, because I feel like someone gave me the “inside scoop”! Oh, Victoria. Our likes and dislikes in actors are so quirky and mysterious. He’s not my favorite actor, but I respect his skill. There are a few that I sense are not decent people, and those I dislike—likely totally unfairly. As this review indicates, I don’t think much of Redford as an actor, but I admit that that really stems from how he butchered one of my favorite novels, Ordinary People, in his movie based on it. I certainly am not in favor of censorship. Ever. Not even by high-minded critics whose power to determine what people do and do not read is huge. And I do understand your squeamishness about blatant racism. But it remains a well-crafted novel, possibly a brilliant, novel. And personally, I find many things offensive in the novel, including vulgar wealth, drunkenness, adultery and murder. But I was made to read it in college anyway, despite my finding those behaviors “wrong.” (And we never once discussed the “rightness” or “wrongness” of those things). So why should racism be considered a greater sin or offense than any other sin or offense that humans perpetrate against one another? Let me make it clear that I abhor racism. And, I’m exceedingly color-blind in my interactions with people. I took a Harvard-designed psychological test that substantiates it–really, I don’t “see” skin color, and therefore truly cannot comprehend people who have racial prejudice and I’m inclined to judge them much more harshly and severely than I would judge people who cheat, get drunk, or seek revenge/vengeance, all of which I can understand, because I have impulses of desire and anger. But enough of all that. Perhaps the question to ask in discussing a novel is, “Who gets to decide what is normal, what is right, what is not right, and what is reprehensible in human behavior and relationships?” Whose story gets told, and whose gets censored? A thoughtful response, Tracy. I may ask some of my students who read in high school how some of these issues were handled—or not! A notable instances of an innocent cross-cultural insult of a icon of another sort was when a Japanese singing group sang “My Old Kentucky Home,” the official state song of Kentucky, to an aghast state assembly, who hadn’t listened to it for a while. They voted to change the words in short order.